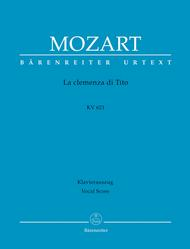 La clemenza di Tito - Titus, KV 621 (Opera seria in two acts). Composed by Wolfgang Amadeus Mozart (1756-1791). Edited by Franz Giegling. Arranged by Eugen Epplee. For 4 soprano voice solos, tenor voice solo, bass voice solo, mixed choir, orchestra. This edition: Paperback, Urtext edition. Paperback. Piano reduction. Language: Italian/German. KV 621. Duration 2 hours. Published by Baerenreiter Verlag (BA.BA4554-90).ISBN 9790006520237. With Language: Italian/German. 27 x 19 cm inches.